Summary: A good example of how a modest budget can make for effective cinema. There are two ways this could have gone. The premise of a nature slasher with a rogue crocodile terrifying a group of innocent tourists was ripe for disaster. 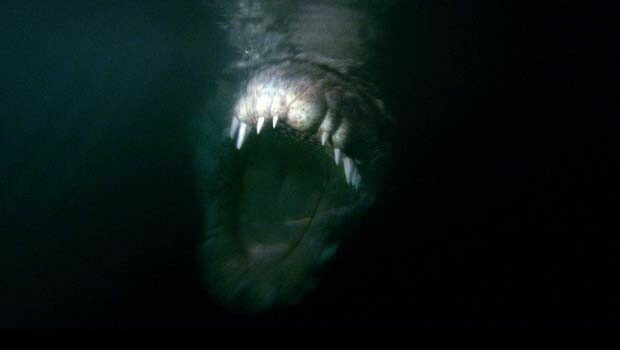 Instead, Black Water pulls its weight by toying with real terror, a rarity in the CGI-infested waters of popular cinema. This is no Jaws, and certainly no Snakes on a Plane either. Instead, Black Water is a good old fashioned survival chiller, with palpable tension and genuine creeps. The protagonists – Grace (Diana Glenn), boyfriend Adam (Andy Rodoreda) and younger sister Lee (Maeve Dermody) – are on a fishing trip in the muddy swamps on Northern Australia. After their boat suddenly tips over and their “guide” appears to be taken away by a rogue crocodile, the three find themselves stranded on the closest tree with the croc in constant vicinity. What ensues is a terrifying race for survival and escape. The tagline, “What would you do”, is suitably fitting for a film with most of the action taking place on and in between trees. The realism is so accurately realised, though, that you soon forget you are essentially watching three people trapped on a tree for what amounts to most of 90 minutes. Directors Andrew Traucki and David Nerlich waste no time in getting down to business, and, true to their word, the film is in full swing within fifteen minutes. To its credit, all of this contributes to creating a real sense of fear, tension and realism and is Black Water’s strongest asset. The risk Black Water plays lies in the overextension of its thin premise. The film may at times appear tedious and derivative, overplaying its deceptively simple storyline. This is, however, counterbalanced by some seriously tense sequences. What the film lacks in high end production values, it more than makes up for in genuine tension. Although the blood and gore are hard to come by (an amputated hand and underwater croc attacks are sure to go past the censors unnoticed), the balance of solid performances and realistic psychological disintegration make this an effective thriller. Black Water is sure to attract criticism from horror fans who are unlikely to be shaken by it measly attempts at blood and gore. For what it’s worth, however, Black Water is a good example of how a modest budget can make for effective cinema.